This is probably the coolest present I could get anyone for Christmas, everyone loves a good handheld game such as a DS Lite or PSP, but when you play classic console, Amiga, and Atari games on a hand held console then that is far better than any of the current consoles. 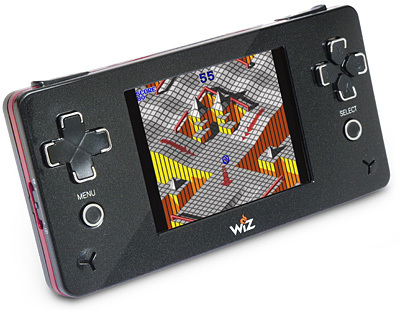 I found exactly that on thinkgeek, the GP2 Wiz is a handheld device which runs linux and can run numerous emulators making it possible to play your favorite classic games. What sold me was that my wife loves Marble Madness and that runs really well on the GP2. If you love Commodore, MAME, NES, Amiga and Atari games then you have to get one of these.